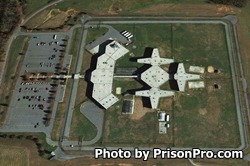 Foothills Correctional Institution is located in Morganton North Carolina. This facility houses both maximum security close custody male inmates and minimum custody offenders with a total capacity of 858 inmates. Close custody inmates are housed in the main facility and are between the ages of 18 and 25. A building separate from the main institution houses the minimum unit, which is comprised of adult male inmates. Offenders in the main institution are housed in single cells. Inmates in the minimum unit can work community service details for the surrounding community, and on road cleanup crews. All offenders at Foothills Correctional Institution can participate in adult basic education classes, and earn a GED. Additionally, the vocational program provides full time training for up to 200 offenders. Visitation for inmates at Foothills Correctional Instituion are by appointment only. You must call (828)-438-6637 to schedule an appointment. General population inmates have visiting on Tuesdays, Wednesdays, Thursdays and Fridays from 8am-10:30am, and from 1:30pm-3:30pm. Additionally inmates have visiting on Saturdays from 8am-9am, 9:30am-10:30am, 1pm-2pm, and 2:30pm-3:30pm. The minimum custody unit utilizes a rotating visitation schedule based upon the first letter of the inmates last name. Because the minimum custody unit schedule changes you will need to call the institution for the current rotation. All visitors should arrive at least fifteen minutes before their visit starts to ensure they have enough time to get through visitor processing.